It’s happening… our oldest is officially a “tween” and has asked for his own room. The timing works out, as baby J and middle brother L are excited to move in together and play all day (hopefully not all night), so K can have the former nursery as his own. J’s nursery was a small room – you may remember that it was converted from the former master bath – so I put a lot of planning into making a space-efficient layout that would be useful and not feel too claustrophobic. As part of the plan I needed a bed that was “zero clearance” – just the size of the mattress, and when I didn’t find what I was looking for shopping, I decided to get creative! As you know, I’m definitely one of those people who thinks everything is more fun when you make it yourself. 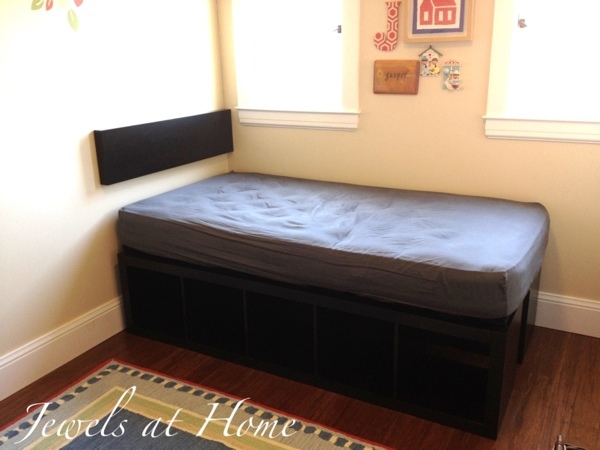 Here’s how we made our compact bed with plenty of storage space below. 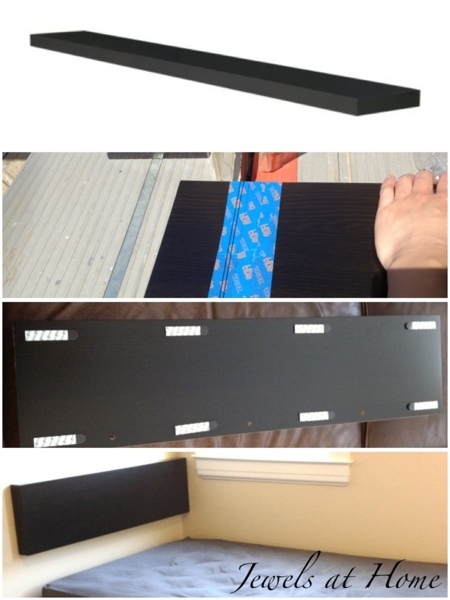 For hanging the headboard, Command Large Adhesive Picture Hanging Strips. I used these black ones to match the shelf. 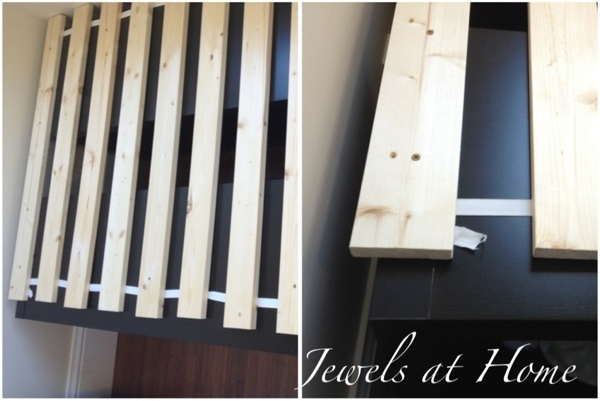 Place the slats about 2″ from the edge of the shelf and hanging over the “head” end by about 1″. 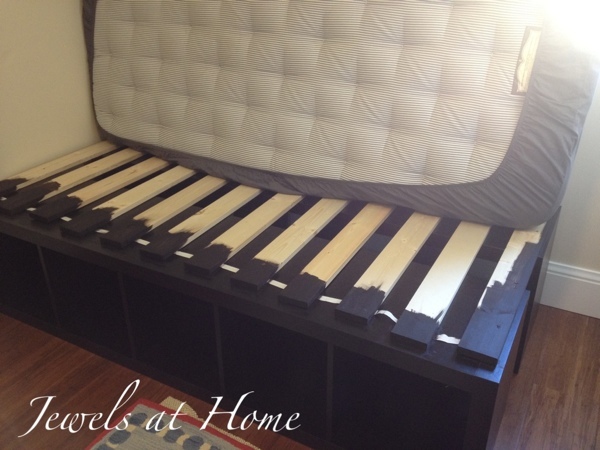 Use four screws, two in each bookcase, to secure the bed slats to the bookshelf at each end and create a stable base. Then then screw down some of the slats in the middle, to keep them from slipping around. LACK wall shelf hung as a headboard for a compact bed. 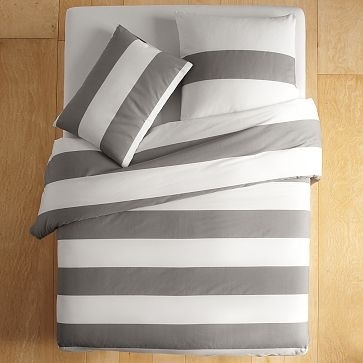 I’m planning on this wide stripe bedding from West Elm to complete the big boy bed! Here’s the finished bed. I’ll put up some more pictures as the rest of the room comes together! 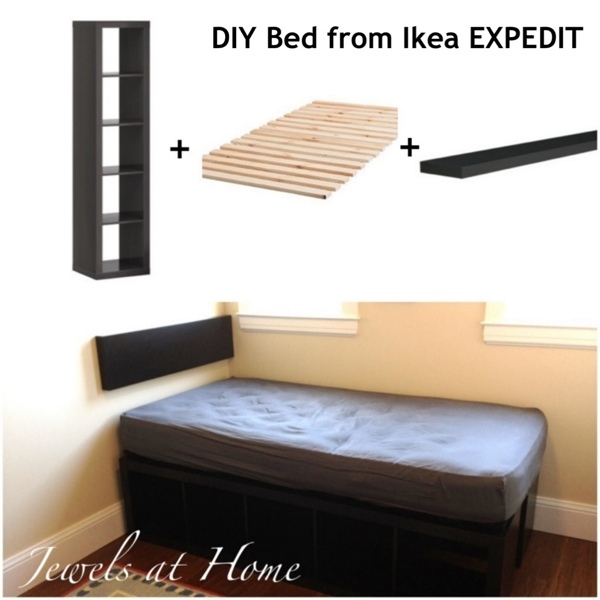 DIY compact bed with tons of storage, using Ikea EXPEDIT. Although the rest of the room is unfinished, our tween boy is very happy hanging out in his new room. This spot for the bed is perfect for our bookworm to read away the afternoons. Wow, this looks great! I remember having a bed with slats and when I jumped on the mattress, I broke the wooden slats. I was thinking this would be great for a dorm room, then read Nicola’s comment. Industrial-strength wooden slats, maybe! However, I would say it is very sturdy. There is very little space that is open between the bookshelves, so there is a lot of support for the mattress. I have sat on the bed with my son, for a total of about 100kg, and there were no problems. how long is the bookshelf? Ikea is discontinuing the Expedit line. If you find one used, they are about 72.5″ long, so a little shorter than a standard mattress. Our mattress hangs over an inch or two on either end, and it’s not noticeable. I work at IKEA, and even though EXPEDIT is discontinued, it has been replaced with KALLAX. Same dimensions, etc, just from a new manufacturer. Kallax doe snot have the 5×1, only see the 4×1. Any ideas on other shelfs? Hi, Do you remember what color paint you used to match the bookcases? Thanks! I didn’t use a specific paint color. I just randomly mixed some paints I had – mostly black with a touch of yellow and red. You only see a little bit of it. Good luck with your project! 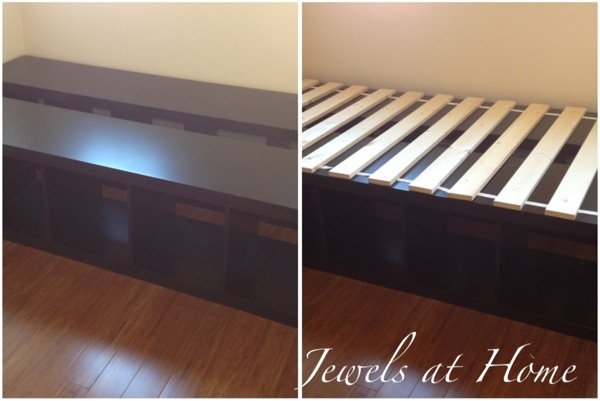 Pingback: 20 Valuable Ikea Hacks For a Lovely Home. You’ll Need This! Hi, it was a few years ago, and they don’t make Expedit anymore. You could try finding the shelves second-hand or use their replacement Kallax, but it is not as long, so it would take some extra work to support the end. Good luck! What size is the madras?? Hi, It is a standard twin mattress which is 38″x75″.